Cincinnati Connects is now CROWN. 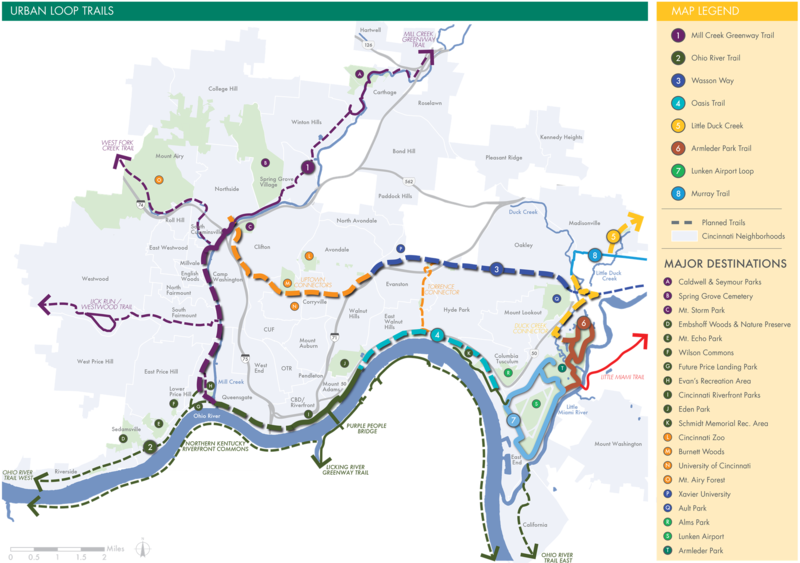 The 2015 Cincinnati Connects Plan outlines the vision to link the existing Little Miami Scenic Trail, Ohio River Trail East, Mill Creek Greenway Trail, Lunken Airport Trail, and Otto Armleder Trail to the proposed Wasson Way, Oasis Trail, Ohio River Trail West, and Little Duck Creek Trail. Cincinnati Connects was funded by Interact for Health and managed/led by Groundwork Cincinnati Mill Creek. 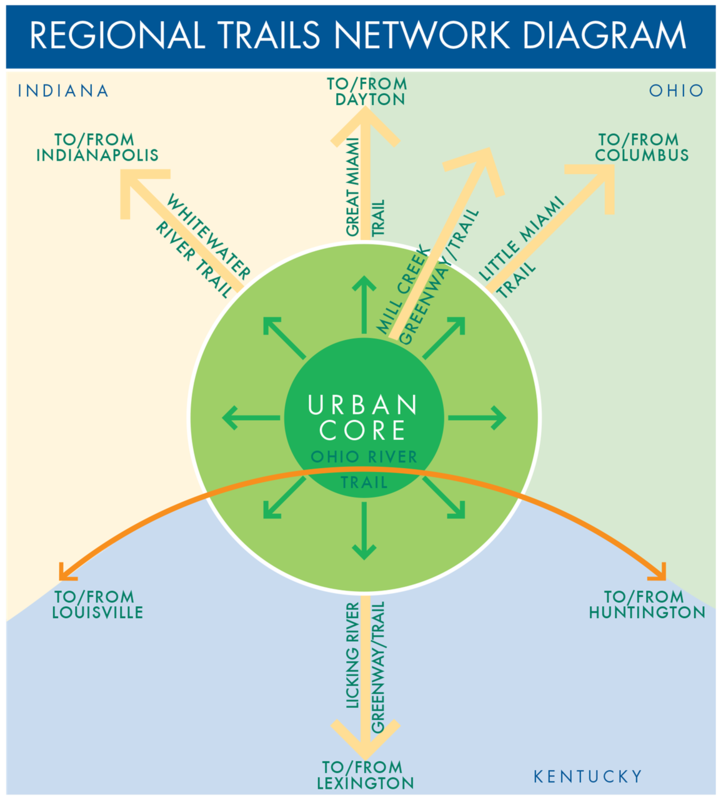 In addition to the trail groups listed above, many other partners were engaged in the development of the Cincinnati Connects plan: Cincinnati Department of Transportation and Engineering, Cincinnati Parks, Great Parks of Hamilton County, OKI Regional Council of Governments, Queen City Bike, Red Bike, and others. Click to view the Executive Summary, full report, or appendices or explore Cincinnati Connects by connection segment below. Click the map above to view the Cincinnati Connects poster in PDF format. 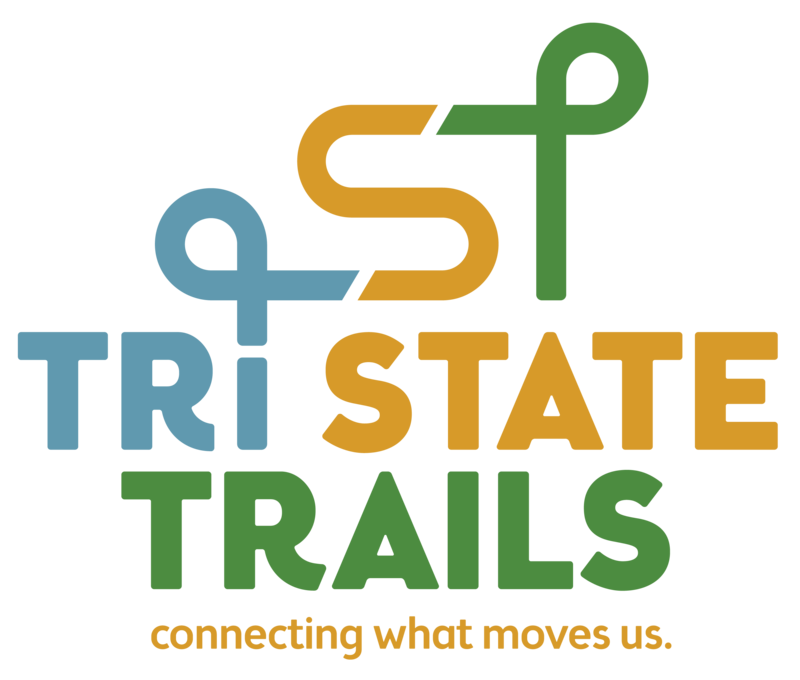 Southeast Indiana via the Ohio River Trail West and Whitewater River Trail. 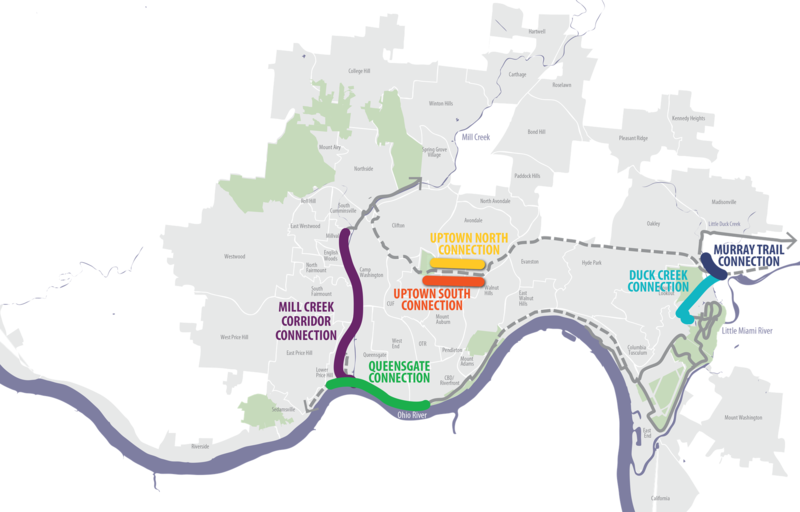 Potential future trail connections to link Cincinnati Connects to suburban Hamilton County are outlined in the map below. 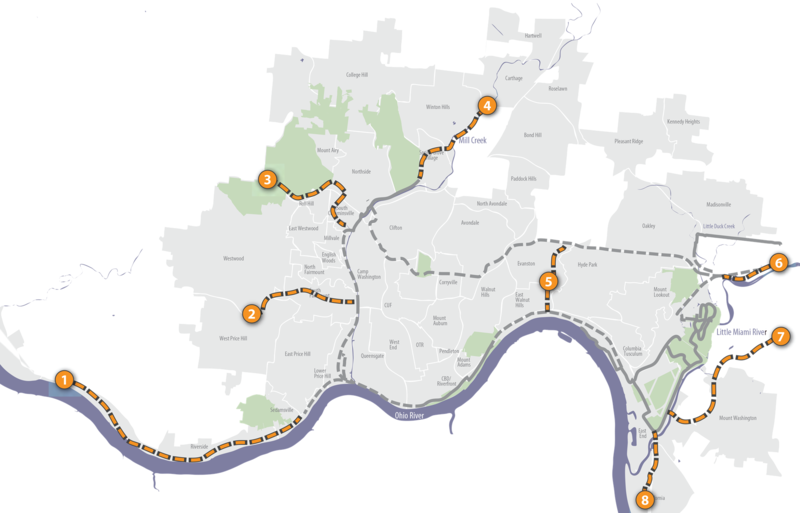 The Cincinnati Connects study was focused on linking portions of the central and eastern trail loops as shown in the map to the left. 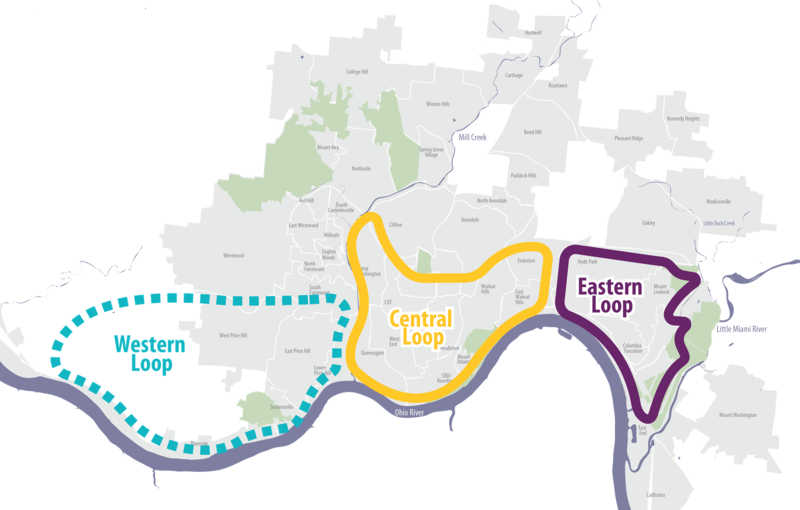 The plan recommends that an additional study be conducted for the western loop to connect city neighborhoods located west of the Mill Creek in the future.